I spied a recipe for these scored potatoes on Taste of Home's facebook page. I immediately sent the recipe to Leesh, cause that's what we do, telling her they looked so good. And I made them a few days later. My 4 year old saw them in the oven and was so excited. And I was excited becasue she's never really loved potatoes in any form, besides that I can sneak them into quiche, breakfast taquitos, and breakfast casserole. But a potato in true potato form has never been something she'd eat. She thought they looked good and she ate them and loved them. My husband and I loved them too! They were loaded with flavor and tasty as can be! 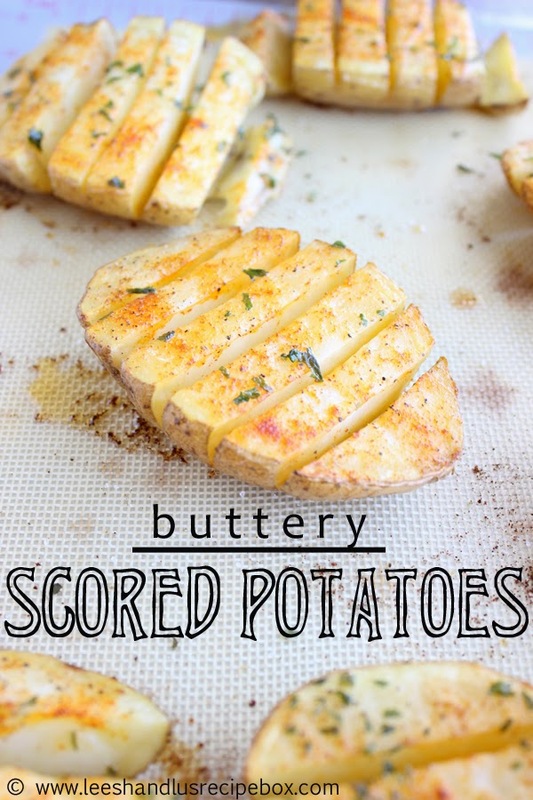 Scored potatoes give the perfect home for drizzled butter. Topped with paprika, sea salt and pepper and some parsley for garnish (you could also season them with any other herbs that compliment your meal), these were eye and tummy pleasing. I also thought they'd be fun for Easter dinner too. We'll be having them Sunday when our friends come for dinner. We'll also be having, ham, salad, rolls, and apple pudding (requested by my husband). 1. Preheat oven to 350 degrees. Scrub potatoes under running water to clean off any dirt. Cut out any bad spots on the potato. Cut the potatoes in half lengthwise. 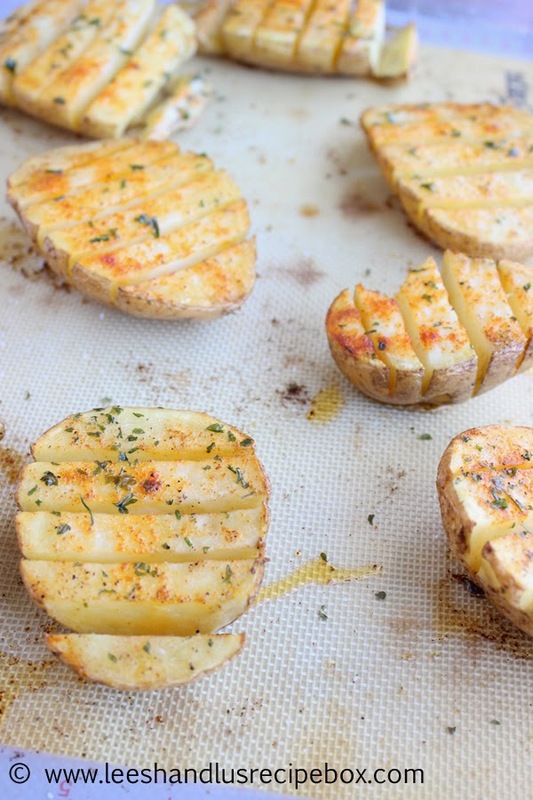 Slice each half every ¼-½ inch, but not all the way through the potato. Fan the potatoes open a little bit. 2. Place on a baking sheet lined with a silicone baking liner or lightly sprayed with grease. Place potatoes on sheet. Using a pastry brush, brush potatoes with about half the butter. Sprinkle them paprika, sea salt, black pepper and fresh or dried parsley. 3. Bake uncovered for 50-70 minutes or until potatoes are tender and cooked through. You can test them with a fork for done-ness. Drizzle them with the remaining butter. How clever and delicious! I love this idea. I'm definitely using this for our next Sunday dinner. Our regular ole baked potatoes are getting boring! Love it!